The Scientific Committee warmly thanks the three plenary speakers, who kindly accepted our invitation. The structure of the project is oriented towards the endowing of some humanoid robots with auditory faculties complying with geometrical and computational foundations involved in humans. At the “hardware” level, this implies the design and assembly of a binaural sensor. This prototype will be reconfigurable rather than highly integrated—so that the pinnae, transducers and/or processing units can be easily modified—and installed on the robotics heads used for experimentations. On the top of it, the project forks into two interacting lines of research, which both concern active audition. First, robotics theoretical issues can be separated into two layers. At the “functional” level, auditory primitives will be designed to the active localization of sound sources, their separation and the detection of voice signals. Here, a function is said active if the computation of its output may involve some information about the motion of the sensor and/or supplemental exteroceptive sensory data. So, active functions are likely to enjoy more accuracy and robustness to noise and environmental changes than their classical passive counterparts. Ego-noise cancellation will also be considered, so as to negate the effects of the noise induced by the robot self-motion. At the higher “interaction” level, speaker recognition, speech recognition and multi-party interaction modalities will be dealt with. 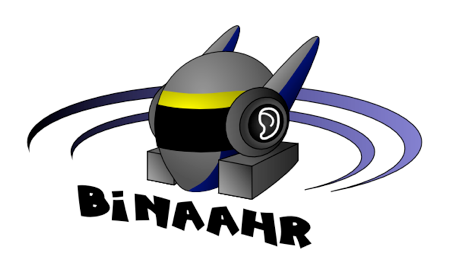 The acceptation of active is then with respect to auditory interaction, in that the robot and its human partners establish a two-way process. As already mentioned, the approach is constructive—the auditory hardware and its associated software will be built—and integrative—for all the faculties designed at each level will be implemented on the machine and experimented in realistic uncontrolled environments. Next, the project proposes a cutting-edge investigation area, which, up to our knowledge, has had no equivalent so far. The ambition is to design active auditory functions for Robotics following the lines of a recent theory from psychology of perception. Contrarily to the passive explanation of perception—i.e. (i)the cortical areas activated by the physical stimulus give rise to the perception and the establishment of a sensation, (ii)next, an action is defined in the current perceptive context—the theory of sensorimotor contingencies explains the sensations by a seamless feedback between the motor commands and the sensed data. In accordance with neurophysiological and behavioral studies, which show that the production of an action involves mechanisms of sensory prediction and the activation of sensory neuronal areas, this theory provides a unified synthetic framework to human perception. Recently, [Philipona2005] formalized the concept of sensorimotor law in a sound mathematical framework, and proposed simulations to the determination of the dimension of the navigation space of a robotics agent from its sensorimotor flows. The interest of this approach for Robotics is fundamental. Indeed, perception and control algorithms operating with no prior information on the environment can be envisioned, enabling a significant increase of the autonomy of such systems. So, in the framework of the project, a simulation platform of sensory functions issued from the theory will be developed.